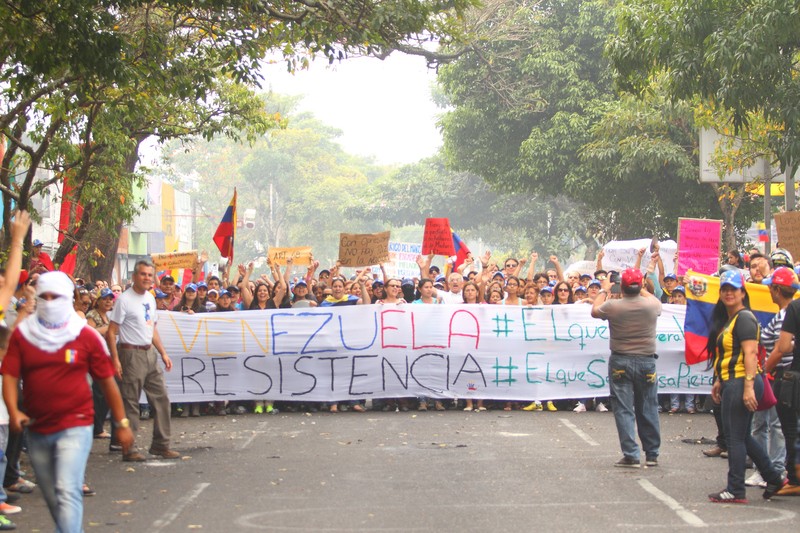 Protester with banner and signs get together in San Cristobal, Tachira Stete, Venezuela. Venezuelans voted in regional elections on October 15 after more than a year’s delay, and after four months of intense protests against President Nicolás Maduro and his hand-picked Asamblea Nacional Constituyente. The election, tainted by shifts in voting places and wrongly printed ballots, left the government holding 17, possibly 18, of the 23 governorships. The opposition has rejected the results, claiming irregularities and undue pressure from pro-government officials. Daniel Levine, professor emeritus of political science at the University of Michigan, first went to Venezuela 50 years ago as a graduate student. An honorary social sciences professor at Pontificia Universidad Católica del Perú, he discussed the current state of the oil-rich country that has been in an economic crisis for years. He recently attended a panel on the subject organized by the U-M Center for Latin American and Caribbean Studies. His upcoming paper, “The Authoritarian Gambit,” in the Latin American Studies Association magazine explores his views in detail. Q: What do you make of the elections? Levine: I’m not surprised by the results. I’m always suspicious of election results in the conditions like these. I don’t know what the opposition can do right now. It’s a bad situation all around for them. Q: Former Venezuelan President Hugo Chávez’s style was much different than that of current President Nicolás Maduro. How so? Levine: Throughout his presidency, Chavez was a much more popular figure. A lot of people liked him at an individual level, he had a great personal touch, he connected with people at an emotional level. He, at least for awhile, presided over a period of surplus and provided a lot of materials goods to people, and most of the world liked that. People thought he made their lives better. Maduro is much less popular personally. He was elected by a tiny margin, a very contested election, and has basically ruled under emergency rule and has repeatedly tightened the screws through controls and repression. Q: There’s a lot of talk in Venezuela about the economic crisis being caused by the U.S. influence. What’s your take? Levine: Just as Maduro came onboard, Venezuela came under great economic distress, but the economic troubles in Venezuela are a self-inflicted wound. What’s going on is the result of bad policies that have distorted the exchange rates and destroyed local productivity from agriculture to manufacturing, food processing to petroleum production, not to mention utter lack of maintenance of infrastructure including transport, ports and airports. I was shocked the last time I was in the country (2010) by how bad the decay was, particularly in infrastructure: roads, bridges, delivery of electricity and water, public health. Things gave only gotten worse, much worse, since then. More than two million Venezuelans now live outside the country. Many are highly educated people with technical skills but emigration is a phenomenon of all social groups: people have left on planes, but many have also left on buses or small boats. Foreign investment and the economy have contracted by a remarkable percent. The GDP is down 37 percent over the past four years, oil output is down, things just don’t function. Venezuela is an economic basket case. Diseases that had long been eliminated, like malaria, dengue fever, cholera and chikungunya, have all returned. These are public health problems, and their return is the result of the collapse of infrastructure, including but not limited to clean water supply. Q: The Trump administration has mentioned not discounting a military option, and has also put Venezuela in the ‘travel ban’ list. What do you think of it? Levine: When Trump talked about a military option, that was a big gift to the Maduro government because it confirmed their rhetoric about everything being the fault of an imperialist conspiracy. Trump has also restricted immigration and financial dealings by members of the government. These are very targeted restrictions. Q: You’ve talked about the opposition trying to undercut Maduro’s government through the legal channels: winning elections, using the tools provided by the constitution, in the courts. But at every step, Maduro has changed the rules. Do you see this conflict escalating into a civil war? Levine: There is a lot of loose talk about civil war but I think it’s a terrible idea. There is a terrible imbalance of force between the pro-Maduro forces and its opposition: the regime has control of the exercise of violence.